To give us a better understanding of the financial condition of a company, my research work will take a closer examination of the extensive financial information that is contained within a firm’s financial tome known as their Annual Report. Take for example a company like Target that does a fabulous job selling products to customers. A good number of consumers are so pleased with this corporation’s performance in fact, that many consider buying shares in the company’s stock. To find out more about their financial situation investors will look to their annual reports to help them determine how well the company is performing. Unfortunately, more questions arise regarding the content of these reports because most individuals are not trained in deducing the information they contain to help them comprehend the true nature of the company’s financial health. Technical questions about the firm’s financial condition and performance cannot easily be addressed unless the key elements in the annual report are understood. Investors must acknowledge that in order to figure out how well a company is doing they must look to the company’s financial statements because those are the documents that can provide details that address the following information: (a) where a company’s money came from, (b) how it was spent, and (c) where it currently stands. Typically, there are four kinds of financial statements in a company’s annual report: (a) the balance sheets that disclose what a company owns and owe, (b) the income statements that reveal incoming revenue and outgoing expenditures, (c) the cash flow statements which show the exchange of currency transactions, and (d) the statements of shareholders’ equity which reveal the changes in shareholder interests (Beginners guide to financial statements, 2007). Individuals who can comprehend the information these statements contain are in a better position to understand the company’s financial condition. 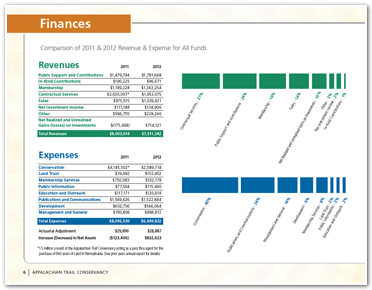 The financial statements in a company’s annual report are useful for many reasons. For example, Fraser and Ormiston (2010) explain that they not only reveal how well the firm is performing, they also show whether or not it is providing opportunities for growth and future advancements (Fraser & Ormiston, 2010). The enormous volume of information in these reports can be intimating to the untrained eye. To help with an overview of the most important aspects, each report contains a 10-K form which serves as a summary that highlight the report’s key components. Smart investors will look to the contents of the firm’s annual report to help paint a clear picture of what a company is doing, what it claimed it was going to do, what it actually did, and most significantly, what it intends to do next. Roth (2008) also points out that annual reports are significantly more important in today’s economy because they have become a platform for which organizations use to expand their investments, launch new products, create more effective marketing strategies, address behavioral or morale issues, and can even alter a company’s strategic direction (Roth, 2008). In other words, the information provided in them are beneficial to investors and creditors whose interpretation of the contents contained within these reports can help them assess the firm’s viability. Lao, F. (2013). Ashford University. Clinton, IA.